How We Create Successful Conversion Pages | ASTRALCOM - Content Strategy, Conversion Marketing and Customer Acquisition. How We Create Successful Conversion Pages | ASTRALCOM – Content Strategy, Conversion Marketing and Customer Acquisition. If successful conversion pages were easy to create, then everyone would already have them. Yet, with conversion rates across industries mostly in the single digits, this just isn’t the case. After 20+ years of e-commerce and e-business, you’d think as an industry, that we’d be achieving better conversion rates. And we can. Developing a successful conversion page isn’t rocket science, but it does require some fundamental elements. 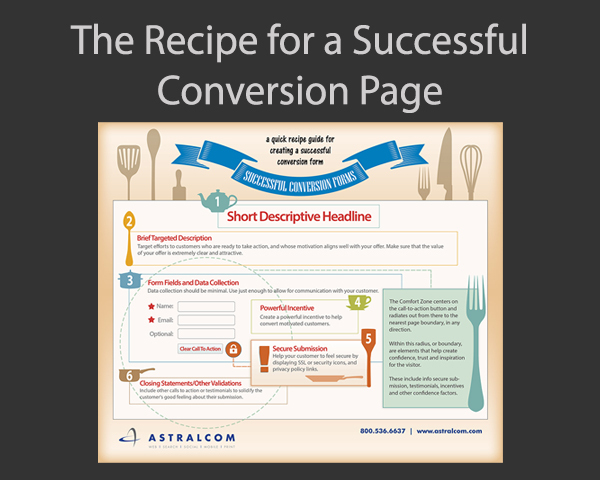 Read our post and learn our recipe to creating a successful conversion page.